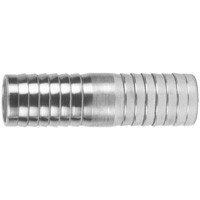 # DIXDM11 - Steel Hose Mender - Zinc Plated Steel - 1 in. They are not for compressible products such as air, nitrogen or steam. The working pressure may vary with the construction of the hose, the type of clamping system used and the application. Consult hosexpress for recommendations. In accordance with the R.M.A. bulletin for oil suction and discharge hose, a coupled length of hose in any size, should be tested to 1½ times the working pressure and held for fifteen minutes without leaking or coupling movement. For additional information and detailed instruction on testing procedures, see the Rubber Manufacturers Association (R.M.A.) handbook.